Lacrosse equipment is all about delivering safety and performance. Since its a controlled contact sport, a combination of approved lacrosse pads are required. 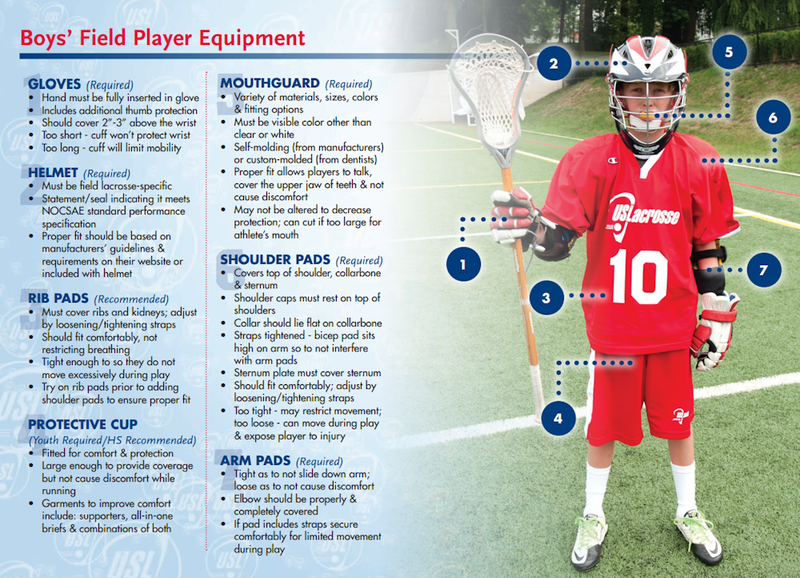 Additional armor can be added, explore these options with knowledgeable personnel at specialty lacrosse oriented sports shops. LLA recommends a few local retailers on our Local Retailers page. These specialty shops are staffed with experienced lacrosse players who can help parents and young players put together affordable protective gear packages. LLA suggests that you print this page and take it with you while you shop at your local Lacrosse sports retailers. When purchasing a helmet please choose a red one to keep a more uniform looking program. Thank you. Stick called a "Crosse" is made up of a head and a properly sized shaft. A mouth guard must be attached to the helmet. Lacrosse Gloves (Hockey gloves do not flex properly for lacrosse). Athletic supporter with protective cup. Rib pads are strongly recommended! Rubber sole cleats (soccer cleats are fine), turf shoes optional for indoor.